So far this year I've been slow on the posting front as far as the blog goes. I think it's partly tiredness what with being pregnant and all, but mostly it's because anything that I put on the blog tends to get written at night after the kids are in bed, and recently I've been making a lot of stuff myself in the evenings and that's kept me away from the computer. I know it's not something I usually do on Filth Wizardry, but I thought maybe I would put a post together soon to share some of the things that I've been making, not because they are particularly special or unique, but more because I've been making things using patterns or tutorials that other people have been kind enough to provide for free on the web, and thought it'd be nice to point folks to the ones that have worked out well for us, in case you fancy making some of the things yourself. It's mostly sewn, crocheted and knitted items made for children. Are any of you into that? Thought this might give you a giggle. Last month I found some of the awesome little wooden hundreds, tens and ones blocks at a thrift store and wanted to find a way that the kids could learn with them without realising they were doing math. We ended up spending part of the afternoon using them as cargo crates on the Millenium Falcon dollhouse that Paul made for our 6 year old's birthday. They wrote out little invoices and delivery confirmations and random messages. It was pretty darn amusing. 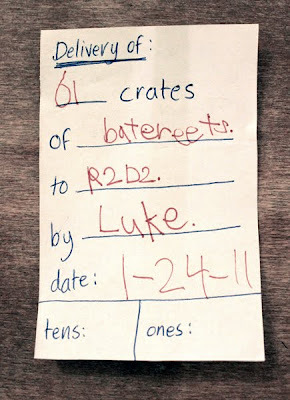 Love how Luke ordered some Batereets (batteries) for R2D2! I reckon we should use up the remainder of the grey spray paint on them to make them more like cargo crates. The weekend before last I was lucky enough to be able to meet up with Kami who writes "get Your Mess On" and runs "Austin Tinkering School". She came over from Texas to California for a few days on a mission to tinker and we managed to dash into SF in just enough time to say hi before she had to truck it back to Montara with Gever Tulley's immersive tinkering workshop posse. Although it was a very brief meeting, I was so glad that we managed to say hi. 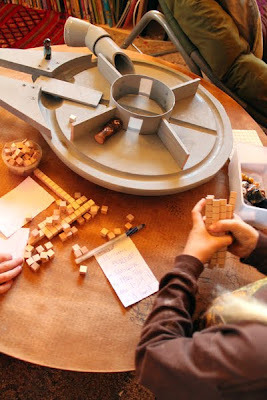 I absolutely love what Kami's been doing with Austin Tinkering School and have great admiration for the energy and enthusiasm she has when it comes to facilitating children's creative dreams. Hopefully we'll get to meet up again and hang out in May when Maker Faire is on. My six year old was very enamoured with one of the vehicles that had been made during the tinkering workshop that day, so Paul helped her sort out something similar based on her drawings and plans over the weekend. It was very sweet watching her own the project and really only wanting help with things like not being heavy enough to push down with enough force on the electric drill. 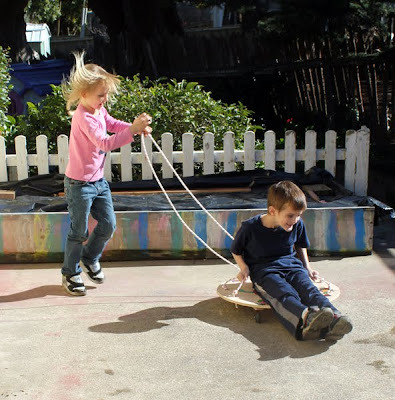 She still wants to add a seat and build a ramp, but in the mean time she and her mates are just pulling each other around the backyard on it at alarming velocities. See what twenty minutes hanging out with Kami Wilt inspires you to do! You're pregnant?! Did I miss you post that before? You made me do a very girly squeel that is very "not me". I remember reading your St David's day posts in the past and this is a great reminder, thank you! I, for one, would love to see the lovely things you have made for children and the links would be greatly appreciated! 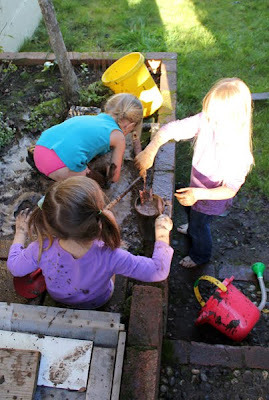 We are several weeks (if not months) behind you weather-wise, but I am looking forward to the messy muddy fun with my boys in the future. You have the world's luckiest kids! And I am SO envious of your warm weather! 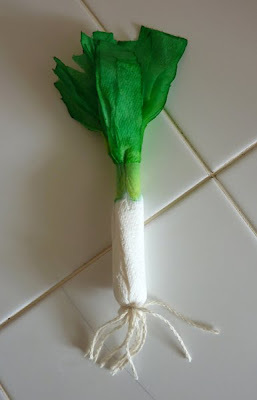 The leek is so cute. We made daffodils and welshcakes today. I miss the daffodils in Llannelli, which is close to the village we used to live in. Love everything you post! Found your blog from Family Fun magazine (Lindsay from Massachusetts, U.S.) - I would love to see some knitted items and patterns. I'm a new knitter and love to get inspiration from other blogs. I would LOVE to have you share links to anything you're making. I love finding new tutorials and projects! i made bara brith when i was pregnant! reading your post reminded me of the lovely indulgence of doing it. I was thinking of you this St. David's Day! I know this is incredibly off topicc for you, but I'm asking everyone: do you know a Welsh history in English our family could read? Something fourth grade-ish would be wonderful, but anything for kids would be a gift. We're going this summer, to Conwy and Caerphilly, and I can't find anything to prepare the (American) kids for the history of the fabulous castles! Thanks for all your wonderful ideas, Welsh and otherwise. I would love to see what you have been making, oh and being a home schooling Mum I'm never going to complain if you put up ideas in that field too. I love seeing your crazy messy life gives me permission to do the same. That math bit is fabulous! What a creative way to play with math. I love it! Thank you SO MUCH, I had never heard of TinkerSchool, now I really want my daughter to go to BrightWorks next year! To actually do it we would want to move a little closer, but still. Maybe. We <3 Maker Faire too.